The East Windsor Historical Society is excited to be hosting a book launch and author signing event Saturday, August 12, 2017 from 1-3pm to celebrate the publication of its new history book, Images of America: East Windsor. 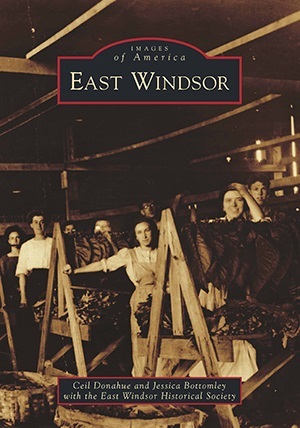 Co-written by authors Ceil Donahue and Jessica Bottomley, the book takes readers on a journey through the past with almost 200 historical photographs tracing the history of the five distinct villages that melded together to become the town of East Windsor and its colorful inhabitants. The Historical Society is planning quite an event with free ice cream, horse drawn wagon rides, and many other free offerings and demonstrations in celebration of not only the book’s release but the bicentennial of the East Windsor Academy and the Grand Opening of the fully restored historic Osborn House, originally built in 1785. ← Grand Opening of the Osborn House!